If you are looking to buy a trampoline for your teenagers (or hey, even for yourself), not just any model on the market will do. You’ll need to be intentional about picking out one of the best trampolines for teenagers, because not all models are designed with the same jumpers in mind. There are a few things to really watch out when picking one out, so let’s quickly look at what those are before going to the reviews. By the time we’re done, I’m sure you’ll have found the perfect trampoline for your needs. This is pretty much THE most important area for consideration. Teens are constantly growing and can very quickly reach the size and weight of an adult. Put 2 or 3 teenagers on a trampoline together and you’re quickly nearing 300lbs, if not more. Most trampolines you’ll find on the shelves of box stores have weight limits of 200-250lbs, sometimes less, sometimes more. If you don’t aim on the high side for weight capacity, your teenagers (and you yourself) WILL be hitting the ground. Maybe not the first week, but once the trampoline springs are worn in, for sure. In our top 10 below there’s a fairly extensive range of large weight capacity trampolines (295lbs to 1100lbs). The bigger the jumpers, the bigger the space they need to be able to jump and do tricks safely. That means that you should ideally look for the biggest trampoline you can realistically fit in your yard. 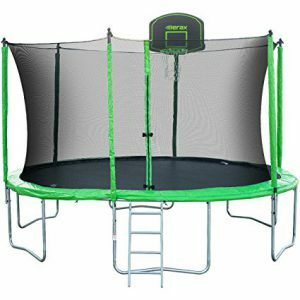 Trampolines come in a large variety of sizes, but in this “Best Trampolines For Teenagers” list, we are primarily looking at the BIG ones, 15 feet in diameter or very close to it. Note that the measurement always includes the safety pad covering the springs and frame, so your jumping mat is smaller by approx. 2 feet… with the exception of the Springfree model. Teenagers love to do crazy tricks and HUGE bouncing. They also are very social creatures who will almost certainly invite their friends up on top with them while they have fun bouncing. So safety is something a parent really needs to focus on when selecting their trampoline. You’ll notice that there are (with the exception of the Springfree) 2 different styles of enclosure nets: on the OUTSIDE of the safety pad, and on the INSIDE of the safety pad. Both have their benefits and detriments, and both claim to be “the safe way to do it”. You’ll have to decide for yourself which feels safer to you. On the outside allows “rest zones” for non-jumpers, and less of a chance of bouncing into the pole structures that hold up the enclosure. However, some worry that with the eventual wearing down of the safety mat, jumpers will have dangerous access to the springs. On the inside eliminates any fear of landing in the springs, and any fear of the jumper falling out. However, it is harder to keep a non-jumper from being double-bounced while he’s waiting for his turn at the side. It also makes the actual jumping mat feel smaller, as the “walls” are closer in, forcing multiple jumpers to jump closer together. Many of the trampoline brands do something unique to make their model “the safest”. Read through the descriptions below and you’ll see what I mean. If you can find a trampoline that is TUV certified (TUV certification ranking higher than TUV tested), that’s the mark of a company that is doing all they can to make sure the chemical composition and structural design is as safe as can be. Read more on TUV certification here– or read more about trampolines. In truth, they make trampolines WAY safer than they used to. 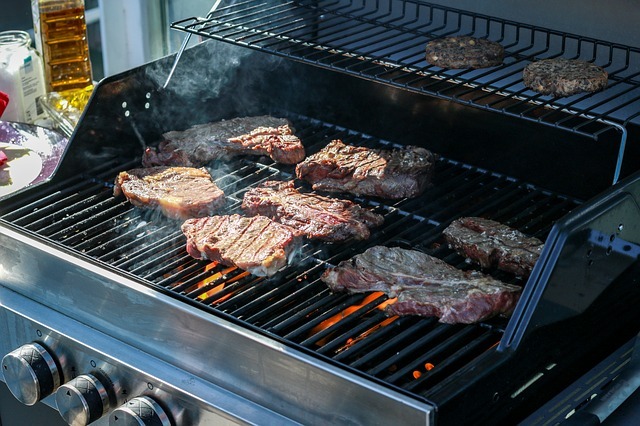 You can’t go wrong with any of these on this list. 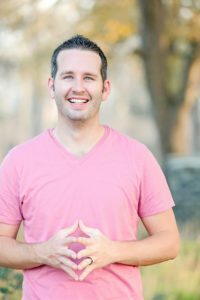 Now that you know exactly what to look for, let’s take a look at my top picks for 2019. This trampoline by Zupapa is one of our top picks for the year, as it is a combination of quality parts, awesome bounce, and attractive price! Besides that, Zupapa trampolines are also known to be extremely safe, so if safety is your number one consideration, you’ll like that they achieve TUV certification (pass overall safety standards) on each trampoline. That you get everything you need at once with your purchase: the trampoline mat & springs, blue safety pad, ladder, enclosure net, rain cover, 6 wind-stakes, and assembly t-hook. Zupapa even throws in a pair of cotton gloves to protect your hands during assembly! Apparently it’s fairly easy to install compared to other trampolines… the instruction video is here on YouTube if you want to see what you’d be getting into! You can FEEL that this is a sturdy and heavy duty model, which is exactly what teenagers need! (The frame is built from rust-resistant galvanized steel, 42mm diameter x 1.5mm thickness). Zupapa customer service is reported to be absolutely top notch! Mentions of replacement for damaged parts at not cost, quick response times, personnel being easy to work with and generous are all OVER the reviews! Their warranty is pretty amazing too… from 6 months to 3 years on various parts! The DoubleBounce AlleyOOP trampoline is one that you’ll really want to focus in on if you’re primarily looking for the safest trampoline on the market – and know you’ll likely have more than one bouncer on it at the same time. It has over 50 patented safety innovations that make it pretty amazing… and no, all that “safety stuff” does not make it less fun while jumping (in case your teens are asking). On the contrary, they make jumping smoother, better on your body, and safer for “creatively active” teens! DoubleBounce technology: It actually has 2 mats, one above the other. What this does is it creates a shock absorption zone (much like a giant air pillow), which lowers the impact on the body that comes with being double bounced by a fellow jumper. 128 high performance springs (20 more springs than the 2 trampolines above that already had a high number… 128 is by far THE highest number of springs we’ve found on a 15ft, much less a 14ft like this one). This gives a super soft landing, a smooth downward bounce, and exceptional height in the return bounce. An overlapping doorway (with no zipper that will eventually break) that gives parents peace of mind that their jumpers won’t be falling out. A frame pad that has been reinforced, redesigned, and double-stitched so it will last longer than your average pad. A safety net that actually exceeds ASTM Impact Performance testing – it’s their strongest (and easiest to install) safety net, designed to last a lifetime. 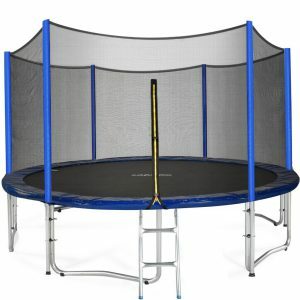 If you think you’ll be letting more than one jumper on the trampoline at a time, want a very safe and well built trampoline that will stand the test of time (with a remarkable warranty to back it up), and if you have a budget that can handle the fairly steep price tag on this amazing unit, you’ll definitely want to check it out. If the price is too high though, fear not, there are lots of other great models in this list! If realistically, the trampoline you’re planning to buy will have several teens on it at the same time, you’ll need a model that has a very high weight capacity. Forget 375lbs… this one comes in at 800lbs!! 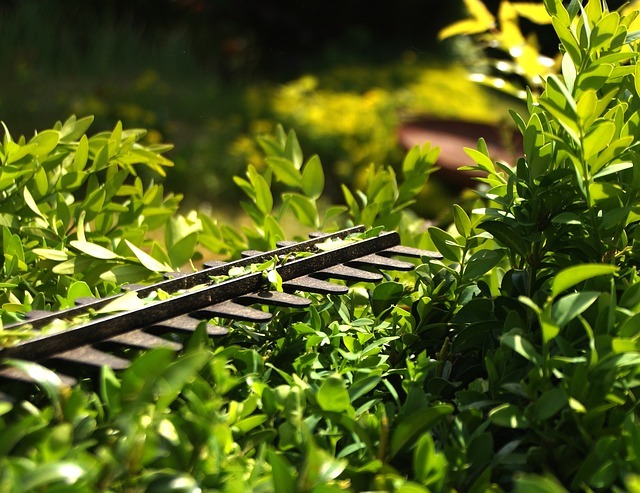 It is designed for year round use, even in areas with harsh weather conditions. 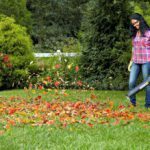 That means year round play for your kids, and no need to store it away before winter comes! The 110 springs are 8.5″ long (most are 7″), giving GREAT bounce! There is NO single user max weight, so adults (or really solid teens) can jump on it without worrying about hitting the ground. The ACON Air is another trampoline that’s a little on the pricey side. Nothing too crazy but a little more expensive than most of the products on this list. 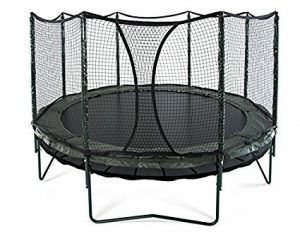 But it’s worth every penny of its cost if you’re wanting a super high capacity trampoline for your teenagers, and I’m sure you’ll come to the same conclusion if you decide on this product. The ORCC is a trampoline that’s actually quite similar to the Zupapa (#1). It’s a large, heavy duty, safety-net-on-the-outside trampoline that your teens will really enjoy. It’s another trampoline that comes with 108 springs and a super heavy duty frame, making it a great bounce and exceptionally sturdy for big kids. It comes with the whole kit (trampoline, springs, safety pad, ladder, enclosure net, rain cover, t-hook, and wind stakes) so you don’t need to purchase anything else. The safety pad is extra wide so it covers the springs and frame – a bit more than your average pad. It looks and IS similar to the Zupapa above, but it comes at a slightly cheaper cost. You see these savings in the frame legs not having the added balance contact points, the weight max at 330lb, reports of slightly less bounce in the mat for light children (still great bounce for heavier ones, so teens should be a-ok), and less warranty. All of these aren’t deal breakers though, in my opinion. The one main complaint for this trampoline seems to be that the assembly instructions are seriously lacking in quality (“written by a non-native-English speaker”). However, if you are handy and work through it using common sense, I think you’ll have a trampoline you and your teenagers will be really happy with! Here is another well made and high quality trampoline with a high weight capacity, perfect for teenagers. If you decide on this octagonal trampoline, you’ll be getting one of the biggest trampolines on the market – at 16 feet across. One unique feature that the Magic Circle offers is a safety net that is integrated right into the jumping mat. There are NO openings between the mat and the “walls” other than the door section, making it extremely safe; there’s no way anyone could fall through or get stuck in the springs (the springs are outside the enclosure). This “Magic Cage” is made out of the same fibers as the jumping mat, having a tensile strength of 350 lbs. per square inch, and it connected to the support poles by springs (so it has “give” if someone bounces into it). The only “con” seems to be that you can’t easily sweep off fallen leaves; other than that, reviewers love it! It’s a sturdy, heavy trampoline, with welded steel legs – unless you have gale-force winds, this is not going to blown away too quickly! Because this is a higher end trampoline it’s going to cost a little extra to purchase. I personally think it’s worth every penny but it’s certainly not a budget special. If you’re wanting a huge trampoline for teenagers who like to do lots of crazy tricks, this one is about as safe as you can get – and has great reviews to boot. I’m really excited about this trampoline. Besides having a sleek and modern look with the concave safety net, it’s also a great choice for a big open yard, with 12 enclosure poles (nearly double the usual amount) and a steel frame engineered for exceptional structural stability and support. You’ll find it easy to install: the frame uses push-pin bolt technology and machine welding (no bolts, screws, brackets, braces, etc. are required! ), and the net installs quickly with Velcro straps and pole sleeves. There’s an incredible “industry leading” warranty, and all parts either meet or exceed the ASTM U.S. Trampoline Safety Requirements, so you know the company is serious about giving you a top quality, very safe product. You can purchase it in 12ft, 14ft, or 15ft depending on which size fits your backyard best. 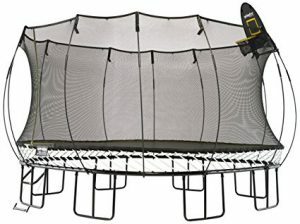 Overall, the Skybound Stratos Trampoline is definitely deserving of being in the list of best trampolines for teenagers. It’s a fairly priced model, and you can be sure your teenagers will be enjoying it well into adulthood. 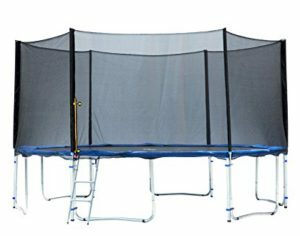 Now we’re going to look at a more budget-friendly option than the last few – this Giantex model is your pretty basic high weight capacity trampoline, and it will definitely do the trick… and have your teens outside doing lots of tricks too. This trampoline is apparently one of the QUIETEST trampolines ever! Review after review noted how surprisingly and incredibly quiet it is while kids (and adults) are jumping on it – you’ll love this if you have teens who want to jump later at night, especially if your neighbours are close by! Everything is included… you get a lot for the low price point: the steel frame (the 15ft has 5 legs, not 3 as pictured), the jumping mat, safety enclosure combo, ladder, and spring pull tool for assembly. The only other thing you may wish to purchase is wind stakes, as the frame is apparently rather light compared to other models. 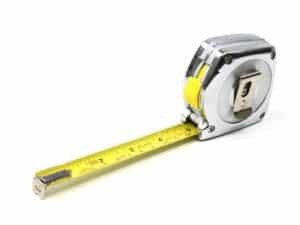 You’ll be pleased by how easy it is to assemble – all parts including hardware are listed and numbered in the instructions, and assembly parts are also diagrammed. Because this trampoline is a pretty basic model, it’s very affordable and costs around as much as your standard box-store trampoline that only allows 200lbs. 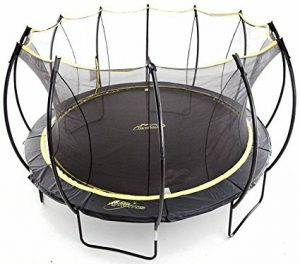 Don’t expect much of a warranty on this one, but if you’re looking to save a few bucks and still get a high weight capacity trampoline for your teenagers, the Giantex 15 ft Trampoline is possibly the one for you. Another decent, moderately priced trampoline for teenagers is the Exacme T-Series Combo Set, which comes in 12, 13, 14, and 15 ft options, and includes everything you’ll need to get your teens enjoying hours of awesome bouncing. The safety nets extend a bit higher than the average, so you can rest assured your big jumpers will still benefit from them. The company listens to reviews – they have redesigned the zipper system making it wide-toothed and reinforcing the netting all around it. They are working to eliminate the issues customers had with it previously. All Exacme trampolines not only have TUV Certified, but also have GST testing and are UV testing approved. The W-shaped legs have also have balanced contact points, which help stabilize the trampoline so you can worry less when you have heavy jumpers having fun. The frame is made from strong, rust-resistant galvanized steel tubing, which is longer lasting than traditional welded trampolines. 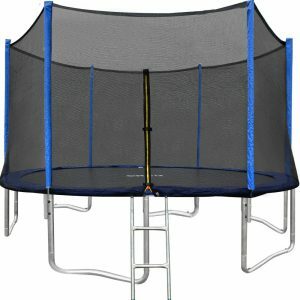 The Exacme T-Series trampoline is a mid-range trampoline that scores well in all areas (other than warranty). It’s overall solid, although not exceptional in any particular area. My advice, if you can score a deal on this one, nab it! This is one of the low-budget entries on the “Best Trampolines for Teenagers” 2018 list. 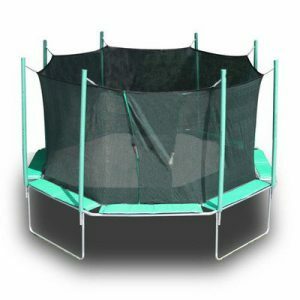 If you’re looking for high weight capacity trampoline that doesn’t cost a ton, keep reading. Right off the top, this trampoline will attract many teens simply on account of the basketball net. I’m sure you can easily picture how that will add to the hours of enjoyment on a trampoline for many teens! 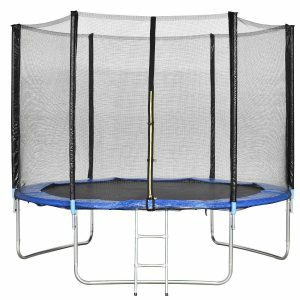 This 14ft trampoline combo comes with everything you’ll need, including the ladder and net (which is made of very hard plastic, a “Safe Play” hoop that’s 13.8″ diameter, good for size 3-7 balls). It does not come with a basketball however… your teens will have to provide their own. It’s fairly easy to put together, according to reviews, but the springs do need some good wearing in the first week to get the bounce “really going”. Although the safety pad has some lower reviews, it IS on the outside of the enclosure net, meaning the netting does stop jumpers from landing on the safety pad and springs in the first place. 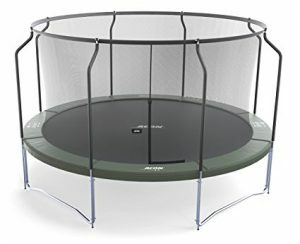 Truth be told, I think this is a STEAL of a deal, for a large weight capacity trampoline. While you do “get what you pay for” in some areas, your teens will still have a great time on this one, and your wallet will love it too! This list wouldn’t be complete without one of the unique and high-end Springfree trampolines. This 13ft SQUARE trampoline gives a huge jumping area for your teens (equal to a 16ft square with safety mats), and it’s chalk full of great features that you’ll love! Not sure if you caught it above, but this trampoline has jumper weight max of 220lbs each, with a structural load capacity of 1100lbs… yes, that means you COULD have 5 very large teens or adults enjoying it AT THE SAME TIME. Safely and “legally”. It can also hold up to 1540lbs of static weight! You can add a tgoma accessory game system (sold separately), turning your trampoline into the ultimate outdoor interactive digital play system! Springfree trampolines are able to be left outside year round as they are built with top quality triple-layered powder-coated galvanized steel frames and super UV resistant and tear-resistant polypropylene nets and mats, and composite fiberglass rods. There are NO springs! That means several things: no springs that jumpers to fall onto or through, no sharp edges (the frame is well below the mat), a much larger jumping area! There’s SO much to say or write about the Springfree trampolines – how they work, how they are built, how they are so safe yet bounce SO well, but instead of reading it from me, click through to “Take A Closer Look” and learn all about them from the source! They are the priciest option on this list, but if there’s room in your budget, your teens will LOVE this one and it be the last one you’ll ever need to buy. Get Your Teenagers Outside, Having A Blast! Having a backyard trampoline for your teenagers is a GREAT idea. It encourages healthy activity (heart rate and agility), lots of laughter, and time to socialize while having fun! Jumping on a trampoline is also a great stress release, and we all know that being a teenager is a stressful time. A trampoline is a great outlet for that stress! 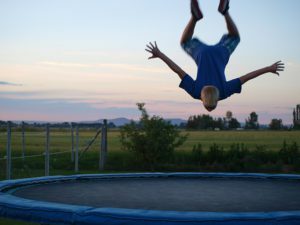 But the reality is that teenagers do need a different trampoline than a 3 year old does – they need a high weight trampoline, a big one, and one that is going to be safe even when they do some big tricks. They need one of these best trampolines for teenagers! I hope this has been helpful for you. Let me know if you have any questions in the comments below and I’ll be happy to answer them as best I can. Wishing you and your teenagers happy bouncing! Any thoughts about the Zuly trampolines?? I have to be honest with you, I hadn’t heard of Vuly trampolines before you mentioned them (I assume Vuly, not Zuly, as that’s what Google came up with). I did some research on them and they certainly look like solid, heavy-duty trampolines that can handle quite a bit of weight. Springs and springfree, looks like they have quite a range. Unfortunately I don’t know enough about them to offer an honest opinion though, sorry. I am impressed with a few things about the Vuly company (doing some reading on them) – like that they will offer a lifetime half-price deal on replacement parts (ANYTHING), even well after warranty. I also REALLY like that Vuly advertises loud and clearly that they donate products to and sponsor charities and organizations that benefit children – even unknown ones are welcome to approach them. That’s awesome. Sorry I can’t be of more help, Anna! Have a good day yet! Hello everyone, my name is Nate! I love being outdoors with my family; we find ourselves enjoying our backyard as often as the weather allows, and are always working on or improving something! 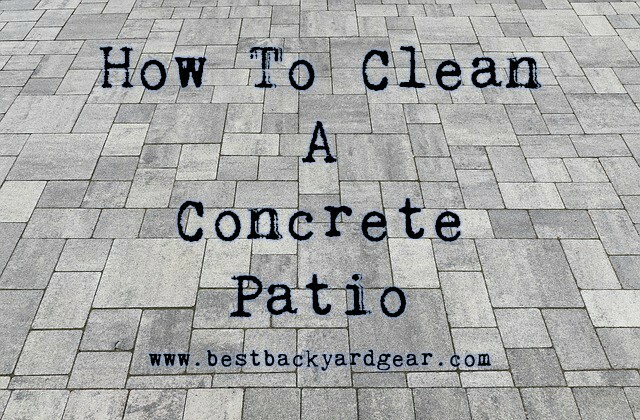 I hope you enjoy this website – it’s dedicated to helping you find the best backyard gear for your own outside oasis! If you have any questions or feedback, comment on any post and I’ll get back to you quickly! 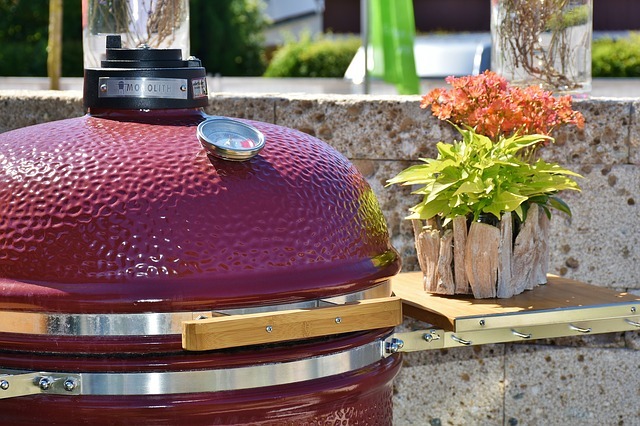 Copyright © 2019 Best Backyard Gear. Powered by WordPress. Theme: Spacious by ThemeGrill.